The market town of Grantham in Lincolnshire with a population of around 35,000 was twice voted ‘Most boring town in Britain’ and it’s said that some locals began to take a somewhat perverse pride in the tag at that time. Since those days the town has grown in size if not necessarily reputation due to it’s commutability to London via the main London-Edinburgh railway line. Probably the two most well-known inhabitants of Grantham were Sir Isaac Newton and Margaret Thatcher and both these figures are paid tribute to in the town, Newton with a statue and a plaque at his former school whilst Thatcher’s birthplace at her father’s grocery store is also commemorated. Like many similar towns, Grantham is a mixture of ancient buildings and extremely ugly modern ones. Whilst visiting I visited three of the oldest in the town in The Angel and Royal Hotel, and pubs, The Blue Pig and The Beehive. The former had large areas of medieval architecture still viewable inside and out and was a truly atmospheric building. I and friends sat in the original Georgian courtyard, a welcome cool haven after a strenuous walk along the Grantham Canal earlier, and admired the way the building had been lovingly kept. Locating The Blue Pig was a real stroke of fortune. This ancient public house was an absolute gem and had a friendly welcome to match. As we ate honest and simple, value for money dinners, we had great entertainment from other nearby customers too! Firstly a group of middle-aged people trooped into the bar wearing flamboyant 1970s’ ‘gear’. We hoped that they really were heading for a fancy dress night and that Grantham hadn’t slipped that far behind the times. The indications were not clear however. Momentarily we considered whether we appeared as ‘themed drinkers’ too – themed as people who head out for a pint on an evening dressed as hikers. We quickly dismissed that thought though. Secondly a small group of drinkers who were really old enough to know better continued an angry-looking discussion which transcended into lots of finger-pointing and red faces. What regular fun that group must have on an evening out. In the mood now, we headed to another pub/coaching house courtyard situation that almost every market town in England seems to have. Now here were the local Grantham glitterati in all their finery. There was no shortage of ‘mam and dad’ tattoos nor little inked-in swallows on (red) necks either. Women of a certain age and some indeterminate, in various stages of undress passed through the courtyard in their regular Saturday night ritual as we at passively with our drinks biting our lips. Onward to The Beehive then. Apparently old enough to be out on its own, the building was erected in all of 1550. This was not the only notable thing about the cosy little pub though as outside resides a ‘living pub sign’ made from an actual beehive complete with bees. After being bored by an over-familiar and curious local who assured us that we had probably missed out last train home to Nottingham, we drunk up and headed briskly for the train station and the 22.24 service. This was not without some potential incident however as one back street we unfortunately chose to walk along contained the local chav youth corps whiling their time away. A couple of pushy teenagers followed us mouthing some type of youth patois that was largely unintelligible. Perhaps fortunately for them we were in a hurry for the last train as there were four males with large walking boots on and a drink or two inside us, in our party of five. My overall impressions of Grantham during this brief evenings visit were very mixed then. It had been explained to us by one of our party who had worked in the area that there were/are some truly dire areas of housing in the area and this was not difficult to believe with that little brush at the end of the evening. In fairness however, this needs to be balanced against some of the nicely kept history in the area and what was generally a nice experience. One had the feeling that perhaps a lot of the residents who ventured out socially that evening had maybe headed out to some of the pleasant villages in the area and that Grantham suffered because of that. Certainly the town of Grantham has not forgotten to live up to its former image in some respects and retains a serviceable aura rather than an exciting or even interesting one. 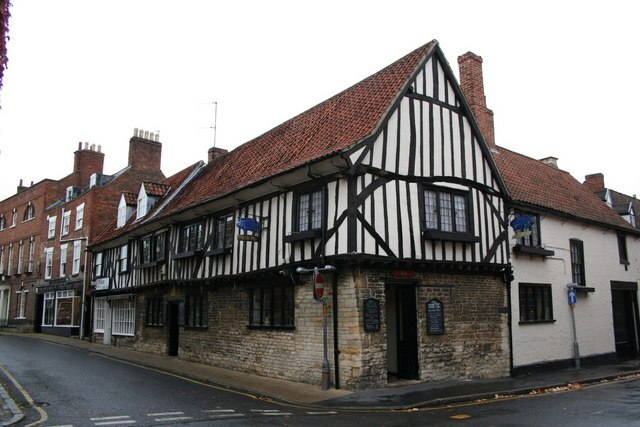 Any visitor to the area could do far worst than visit one of two of the hostelries I mention here though – perhaps after a little history lesson seeking out the story of Sir Isaac Newton, the man who put the Lincolnshire town on the map originally.